On the escalator at the subway station, a teenage girl’s jacket sends me the quote of the day. It reminds me, failure is not only a good thing as it lets you learn and grow. It’s also a fun thing too, with great entertainment value! I never got round to telling you about that time when Junior was planning on buying a boat with his friends. Boat as in sailing yacht. As in 3000 euros worth of sailing yacht. This story happened in my from-my-concussion-suffering blogging time out. But thanks to the teenage girl’s jacket, here’s the story! I knew nothing of his plans of course. Junior is too secretive to tell and I’m to oblivious to notice. It was at a party when the mother of one of his friends asked me: ‘What do you think about the whole boat thing?’ I turned to her, eyebrows raised. ‘You know, the plan of them buying a sailing yacht?’ I choked on my sip of wine. My brain was rattling: should I bluff that I know and act like I don’t care? Or should I instantly go mad about it? Feeling I ran out of response time, I stutter a hesitant ‘What boat?’ and took a gulp from my glass. The friend’s mom explained how they searched Marktplaats, the Dutch Craigslist, for a boat. And how she helped them send the owner an e-mail to put in an offer. Sorry, what’s that? She goes on how she thought it would be a good learning experience for the three gifted boys. ‘Who are stupid AF!’ I tell her in my head. But as I hardly know this what seems to be a nice woman, I give her an polite smile and down my glass of wine and stuff my mouth with a French cheesed baguette slice. We’ll handle that kid when I’m sober and reasonable. ‘It wasn’t like we were just going to buy the boat, Ma, like unseen. We were planning how to get to Friesland by public transport to inspect the boat first,’ says Junior defending their purchase at home. For those who don’t know: Friesland is a part of the Netherlands 3 hours driving by car from our home. It’s a shorter distance to get to Belgium. Which is officially a different country. ‘You may want to research a little further what it means and costs to own a boat,’ I tell hem as objectively as possible. See? I’m learning too. I’m going with this learning experience thing and I’m going to excel at it. The next day, when I ask him about his boat research, he grudgingly admits: ‘Yeah. About that. I decided it wasn’t a good idea after all.’ I try to hide my glorified I-told-you-so-smile: ‘Oh, why is that?’ He shrugs. ‘Yeah. You know. Too much hassle.’ So for those who thinks I’m a neglecting parent. Although you may quite right about that, but this was the moment I went all responsible parent on him. On how he’s a minor and can’t legally buy that kind of stuff without our consent. On how difficult joint ownership is. On all the costs, including those returning ones, that comes with a boat. On maintenance. On a sailing permit. On how bad paying on credit is. On insurance. And so on, and so forth. 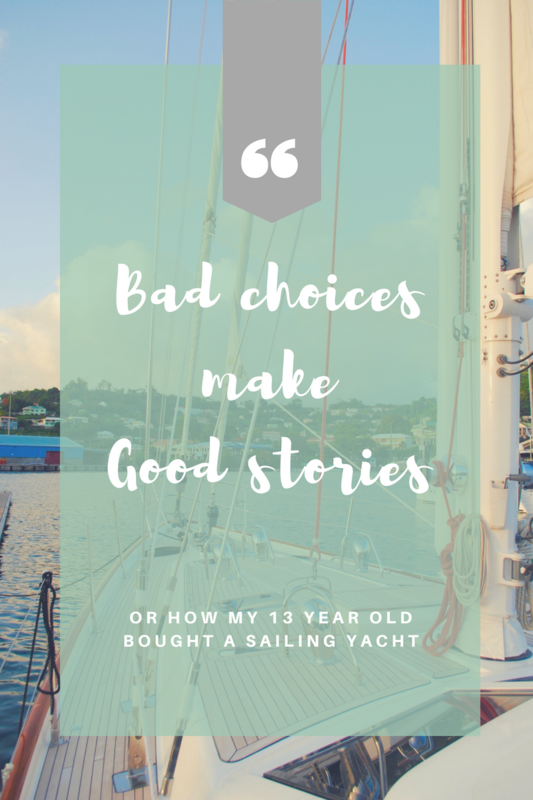 Getting a 3000 euro sailing yacht was bad choice from my kid. But it made a great story, didn’t it?